The Pismo is a direct replacement style to most original equipment benches These truck seats are very similar to the original seats that are come originally in ford dodge chevy gmc full size trucks with the exception of the center fold up console. This bench seat will adapt to your original slide track by drilling 4-6 holes in the bottom plates of the Pismo plates to match original location. Not recomended for single cab trucks. Due to the thick high back that restricts cab space this seat is not recomended for single cab trucks. 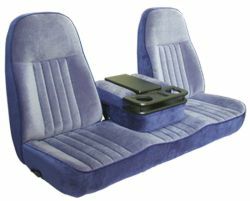 Dodge Truck Seats, replacement aftermarket Truck Seats, leather Truck Seats, chevy, ford, dodge truck bench seats.